6:20 p.m. Parking Lot opens ($5 CASH Only) 6:30 p.m. Doors Open (Seating is first come first served) All guests must be seated by 7:30 p.m. or we have the rights to give up their reservation. 6:30 - 8:30 p.m. Dinner will be served 8:00 - 9:30 p.m. The Show! 9:45 p.m. Guest Departure 1. 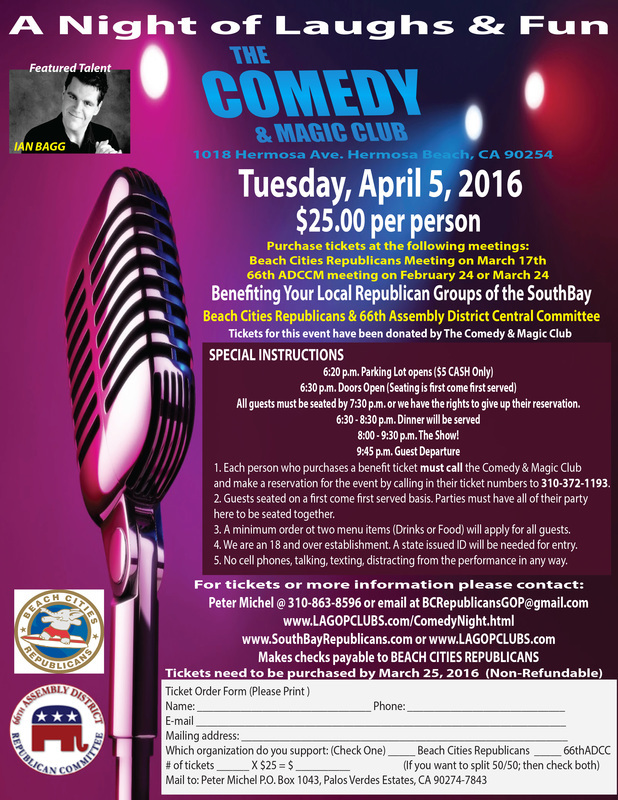 Each person who purchases a benefit ticket must call the Comedy & Magic Club and make a reservation for the event by calling in their ticket numbers to 310-372-1193. 2. Guests seated on a first come first served basis. Parties must have all of their party here to be seated together. 3. A minimum order ot two menu items (Drinks or Food) will apply for all guests. 4. We are an 18 and over establishment. A state issued ID will be needed for entry. 5. No cell phones, talking, texting, distracting from the performance in any way.